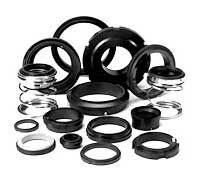 We manufacture world class carbon seal face that is required for water pump mechanical seals. Our carbon sealing face offers controlled hardness and excellent resistance. The carbon seal face also has a polished and finished face and is ideally engineered for water pumps and other mechanical seals. The carbon sealing face offered by us is highly valued by our honored clients in the quality cautious market. Our carbon sealing face is also accessible at the least market prices. We have positioned ourselves in the midst of the most notable carbon mechanical seal face exporters from India.